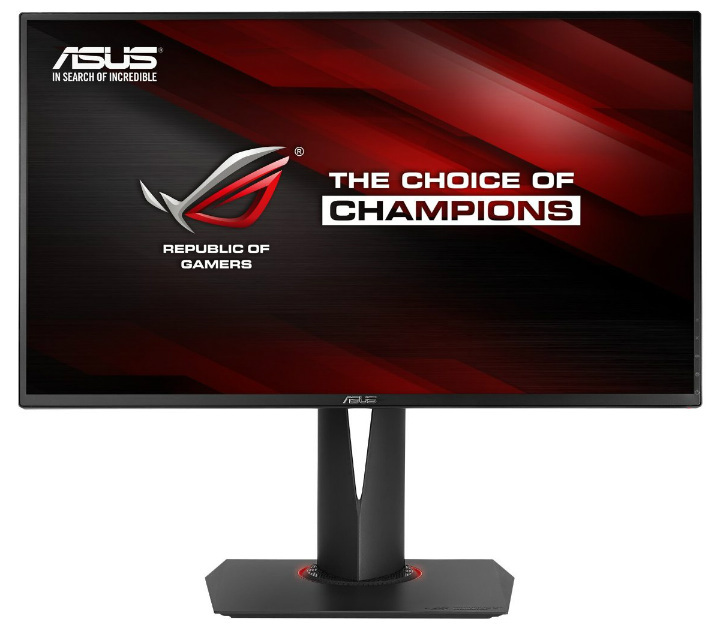 UPDATED: The Asus PG278Q offers a very popular 1440[ screen with a high refresh rate which forms the current gaming sweet spot for visual detail and speed. This monitor has been around for some time which indicates that it’s one of the more successful G-Sync monitors in the market. Let’s take a closer look at the Asus PG278Q’s performance numbers to see how it stacks up to the youngbloods. The Asus PG278Q sports the original ROG Swift aesthetic composed of a sleek, matte black aesthetic with sharp lines and edges. We love this design over the current ROG treatment that has a lighter gunmetal finish and a helix-shaped stand which looks quite complicated. The display area isn’t bezel-free, but the borders are thin and unnoticeable due to a dual-stage design. The Asus PG278Q looks like any modern day monitor, but its back reveals a more interesting identity over the brand’s usuals. The rear of the upright has a ROG badge while the back panel has aggressive angular slits with air vents. The matte finish is nice to the touch, and it doesn’t attract dirt and grime quickly. Build quality is exceptionally fantastic on the Asus PG278Q which shows zero physical defects right out of the box. The panels come together at the seams flawlessly, so there are no uneven gaps or sharp burrs. This model isn’t the heaviest we’ve tested, but it feels solid and should be able to stand by itself. Another characteristic we love on the Asus PG278Q is the easy to use OSD control layout applied to the product. 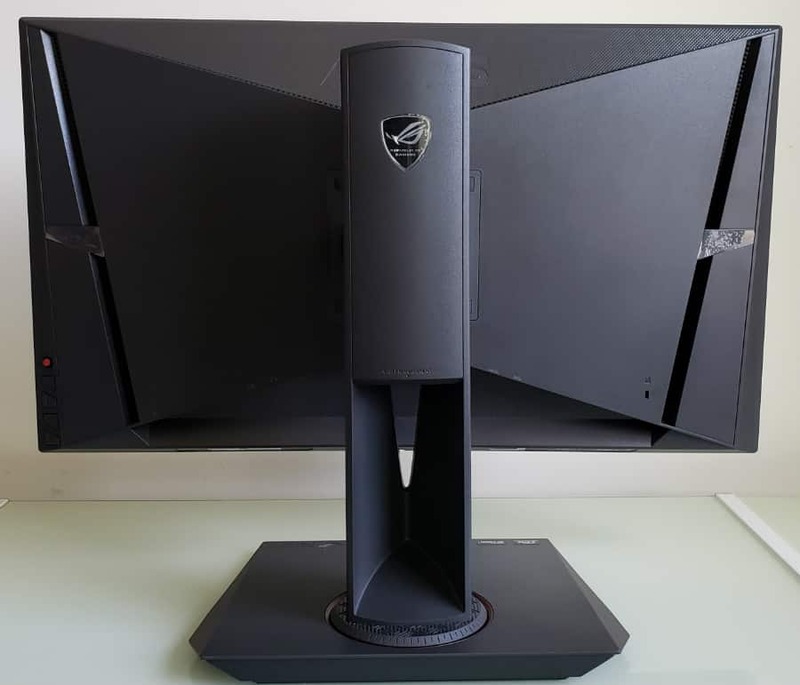 There is unidirectional joystick for OSD navigation and four pressable buttons which give access to the monitor’s GamePlus features and filters. The layout is easy to access since it’s lined up to the side and accessible at the right corner, so users shouldn’t have too much trouble tweaking the display. The Asus PG278Q includes a robust and flexible stand that offers tilt, swivel, pivot, and height adjustments. The square base doesn’t take up a lot of space, plus it has a RED ring which glows when G-Sync is active. It’s also a positive point that you can easily remove this part to reveal VESA holes for aftermarket mounting. 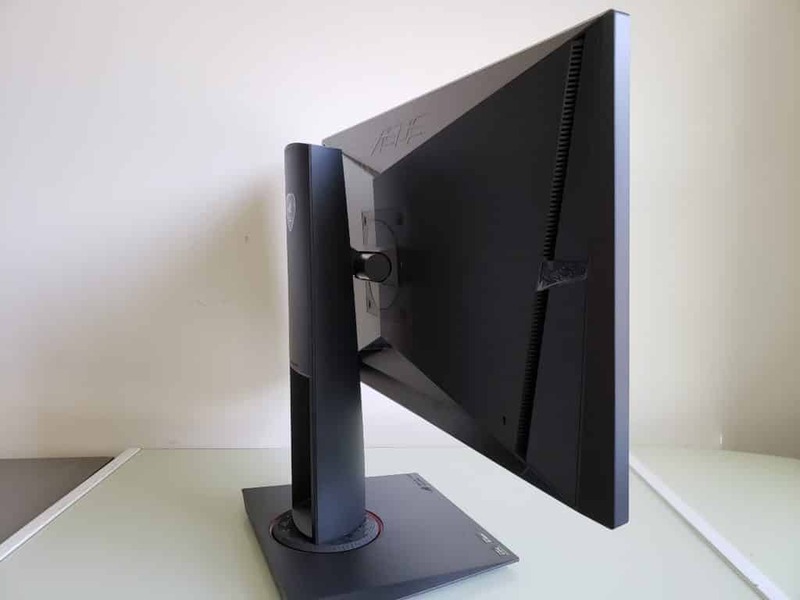 The Asus PG278Q is a G-Sync monitor which means it comes with a proprietary FPGA controller which limits its I/O layout. The down-firing panel only includes DisplayPort 1.2 and HDMI 1.4 for video inputs, along with three USB 3.0 slots for peripherals. 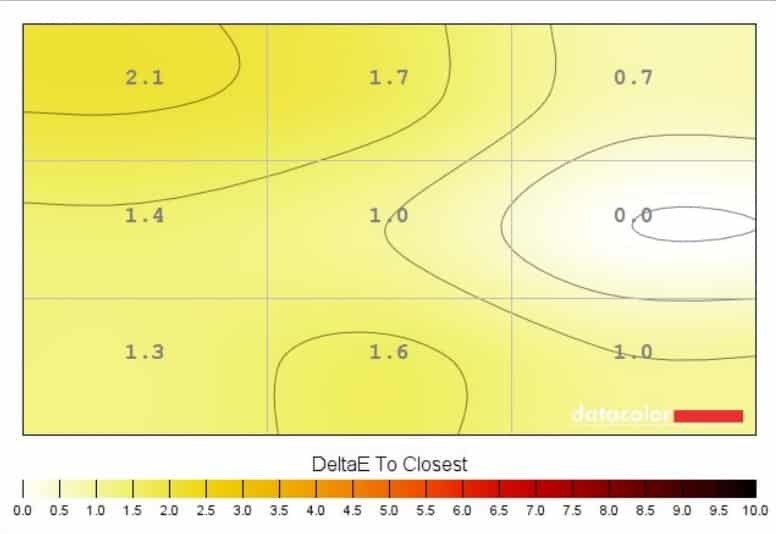 FreeSync variants typically offer more connectivity options, but that matters less for dedicated gaming PCs which only need the DP slot. There are no built-in speakers with the Asus PG278Q, but that’s rarely missed especially in the primary use designated for this class of monitor. A separate pair or headsets will always be better for gaming since they offer better audio power and quality. The Asus PG278Q sports a 27-inch TN panel with a 2560 x 1440 resolution, 144Hz native refresh rate, and 1ms response time. A 350cd/m2 backlight backs it and rated with a 1000:1 contrast ratio, as is typical with most non-HDR gaming monitors. TN panels are known to have poor viewing angles and less vibrancy, but their advantage lies in their faster pixel response time. The Asus PG278Q’s 1440p resolution fits the 27-inch size perfectly, creating a good balance between sharpness and legibility. Text look a bit smaller, but they are not tiny enough to require the use of scaling. This mix is also GPU friendly since it allows midrange cards to reach 60FPS with decent graphics settings while the starting high-end cards are suitable for high refresh rate operation. 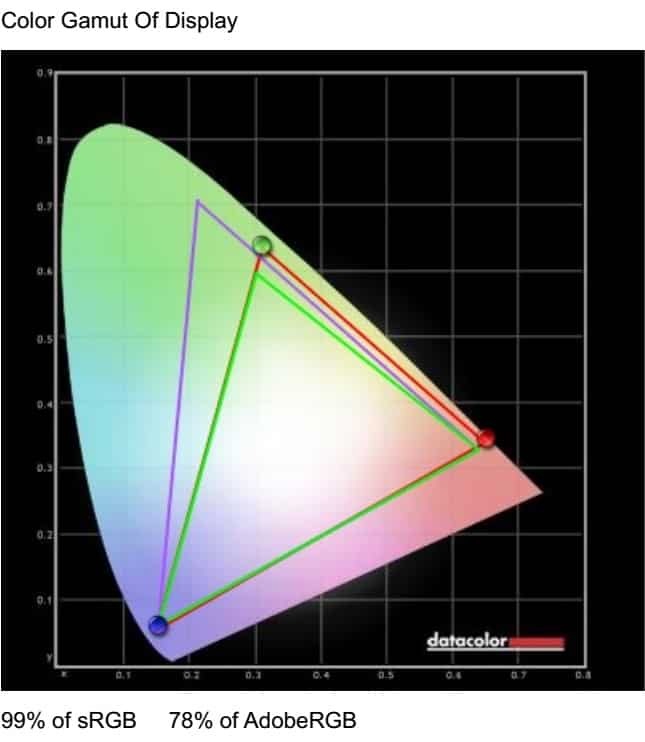 The Asus PG278Q posts incredible results once tested with a colorimeter like the DataColor Spyder Elite V. The screen, despite its handicap in vibrancy, can reproduce 99% of the sRGB gamut with an accuracy of Delta E 1.65. The screen doesn’t need the extra cost of a gadget like the Spyder Elite since it only takes minor adjustments to get a good picture. The TN panel on the Asus PG278Q also performs strongly in brightness and gamma. The backlight tops out at 399cd/m2 when set to 100, while contrast reaches 970:1 by default. Calibrating the monitor to ideal brightness levels and color temps will reduce it to 900:1, but that’s a minor sacrifice to get the most out of the gorgeous screen. Setting the gamma is easy as peas since the Asus PG278Q’s OSD has 1.8, 2.2, and 2.5 presets. Locking it to 2.2 is of course, ideal, but some gamers might prefer the 2.5 option for more depth. Of course, accuracy will drop if you select the latter, but it somehow makes the screen richer in some titles. To be clear, IPS and VA panels have stronger saturation and color representations than TN monitors like the Asus PG278Q. However, the AU Optronics module in this device along with Asus’ tuning produced something as close as possible to IPS when it comes to color quality. The only way to really see the difference is to have another premium IPS model like the PG279Q and set the monitors side by side. Panel uniformity isn’t an issue on the Asus PG278Q as well since the screen’s colors do not stray beyond a DE 2.1 variance from the D65 standard. The backlight on the test unit is slightly dimmer at the bottom row, but this did not have a massive effect on the overall quality of the screen. Games and movies aren’t affected, but all black screens will reveal the latter. Motion handling also isn’t an issue for the Asus PG278Q since its TN panel is faster than most in pixel transitions. This is the most significant advantage of picking a TN panel which enables gamers to enjoy blur-free gaming. 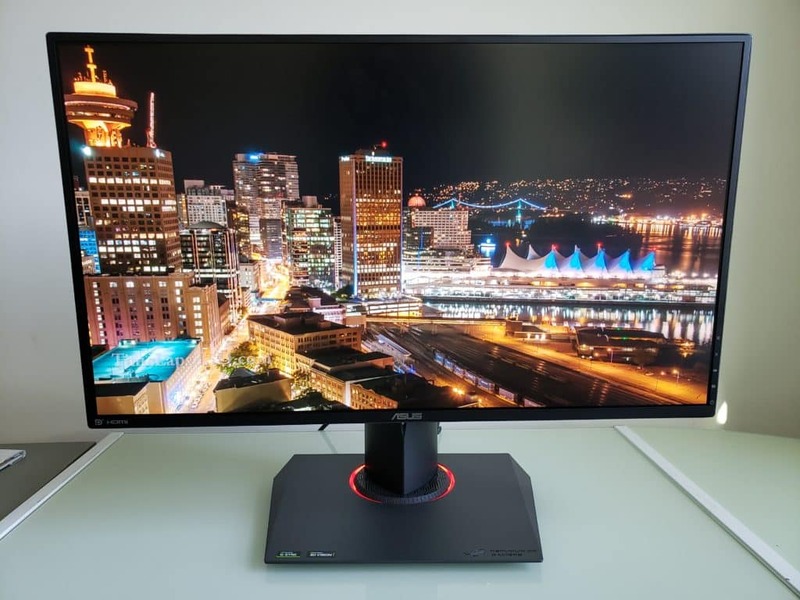 You can also utilize the monitor’s ULMB feature for extreme circumstances, but it requires a high brightness setting, and it will lock out the device’s image controls and G-Sync. As mentioned, the Asus PG278Q is equipped with Nvidia’s G-Sync technology for seamless pairing with powerful GTX and RTX GPUs. Demanding titles like the Division 2 and Anthem will look beautifully rendered at ultra settings, but frame drops won’t disturb you with tearing and stuttering if you have this tech active. Input lag is limited to a little less than 4ms, ensuring that you are always on point and there are no “de-synced” instances at any given time. The Asus PG278Q is still one of the best gaming monitors you can buy if you want better visuals and speed is of utmost concern. The TN panel in this device is one of the best in the industry when it comes to output quality. The screen looks less vibrant than IPS or VA options, but it somehow narrows the gap according to our tests. G-Sync is still a valuable purchase nowadays despite the hefty premium it incurs and the availability of G-Sync compatible FreeSync monitors. Activating it doesn’t need second-guessing, and there are no issues once paired with an Nvidia GPU. The Asus PG278Q is a fantastic gaming monitor if you are looking for a combination of speed, elegance, and visual detail. Note: The Asus PG278Q has been updated to the Asus PG278QR which now has a 165Hz refresh rate and the same performance and quality.